Moreover Ahithophel said to Absalom, Let me now choose out twelve thousand men, and I will arise and pursue after David this night: And I will come on him while he is weary and weak handed, and will make him afraid: and all the people that are with him shall flee; and I will smite the king only: And I will bring back all the people to you: the man whom you seek is as if all returned: so all the people shall be in peace. And the saying pleased Absalom well, and all the elders of Israel. Then said Absalom, Call now Hushai the Archite also, and let us hear likewise what he said. And when Hushai was come to Absalom, Absalom spoke to him, saying, Ahithophel has spoken after this manner: shall we do after his saying? if not; speak you. And Hushai said to Absalom, The counsel that Ahithophel has given is not good at this time. For, said Hushai, you know your father and his men, that they be mighty men, and they be chafed in their minds, as a bear robbed of her whelps in the field: and your father is a man of war, and will not lodge with the people. Behold, he is hid now in some pit, or in some other place: and it will come to pass, when some of them be overthrown at the first, that whoever hears it will say, There is a slaughter among the people that follow Absalom. And he also that is valiant, whose heart is as the heart of a lion, shall utterly melt: for all Israel knows that your father is a mighty man, and they which be with him are valiant men. Therefore I counsel that all Israel be generally gathered to you, from Dan even to Beersheba, as the sand that is by the sea for multitude; and that you go to battle in your own person. So shall we come on him in some place where he shall be found, and we will light on him as the dew falls on the ground: and of him and of all the men that are with him there shall not be left so much as one. Moreover, if he be gotten into a city, then shall all Israel bring ropes to that city, and we will draw it into the river, until there be not one small stone found there. And Absalom and all the men of Israel said, The counsel of Hushai the Archite is better than the counsel of Ahithophel. For the LORD had appointed to defeat the good counsel of Ahithophel, to the intent that the LORD might bring evil on Absalom. Then said Hushai to Zadok and to Abiathar the priests, Thus and thus did Ahithophel counsel Absalom and the elders of Israel; and thus and thus have I counceled. Now therefore send quickly, and tell David, saying, Lodge not this night in the plains of the wilderness, but speedily pass over; lest the king be swallowed up, and all the people that are with him. Now Jonathan and Ahimaaz stayed by Enrogel; for they might not be seen to come into the city: and a wench went and told them; and they went and told king David. Nevertheless a lad saw them, and told Absalom: but they went both of them away quickly, and came to a man’s house in Bahurim, which had a well in his court; where they went down. And the woman took and spread a covering over the well’s mouth, and spread ground corn thereon; and the thing was not known. And when Absalom’s servants came to the woman to the house, they said, Where is Ahimaaz and Jonathan? And the woman said to them, They be gone over the brook of water. And when they had sought and could not find them, they returned to Jerusalem. And it came to pass, after they were departed, that they came up out of the well, and went and told king David, and said to David, Arise, and pass quickly over the water: for thus has Ahithophel counceled against you. Then David arose, and all the people that were with him, and they passed over Jordan: by the morning light there lacked not one of them that was not gone over Jordan. Then David came to Mahanaim. And Absalom passed over Jordan, he and all the men of Israel with him. 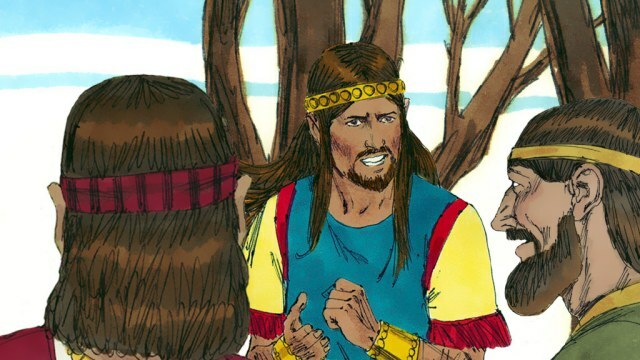 And Absalom made Amasa captain of the host instead of Joab: which Amasa was a man’s son, whose name was Ithra an Israelite, that went in to Abigail the daughter of Nahash, sister to Zeruiah Joab’s mother. So Israel and Absalom pitched in the land of Gilead. And it came to pass, when David was come to Mahanaim, that Shobi the son of Nahash of Rabbah of the children of Ammon, and Machir the son of Ammiel of Lodebar, and Barzillai the Gileadite of Rogelim, Brought beds, and basins, and earthen vessels, and wheat, and barley, and flour, and parched corn, and beans, and lentils, and parched vegetables, And honey, and butter, and sheep, and cheese of cows, for David, and for the people that were with him, to eat: for they said, The people is hungry, and weary, and thirsty, in the wilderness. And David numbered the people that were with him, and set captains of thousands, and captains of hundreds over them. And David sent forth a third part of the people under the hand of Joab, and a third part under the hand of Abishai the son of Zeruiah, Joab’s brother, and a third part under the hand of Ittai the Gittite. And the king said to the people, I will surely go forth with you myself also. But the people answered, You shall not go forth: for if we flee away, they will not care for us; neither if half of us die, will they care for us: but now you are worth ten thousand of us: therefore now it is better that you succor us out of the city. And the king said to them, What seems you best I will do. And the king stood by the gate side, and all the people came out by hundreds and by thousands. The Lord Rebukes Job’s Friends (Job 42:7-9) And it was so, that after the LORD had spoken these words to Job, the LORD said to Eliphaz the Temanite, My wrath is kindled against you, and against your two friends: for you have not spoken of me the thing that is..